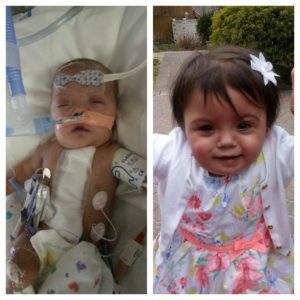 Helping Heart Families » Christiana - Gavin's Got HeartGavin's Got Heart - Our mission is to spread congential heart defect (CHD) awareness while offering support to families with children affected by CHDs. Christiana has a hypoplastic right heart syndrome with transposition of the great arteries and severe hypoplasia of the right pulmonary artery. On February 4th, 2014, she underwent her first open heart surgery. Christiana has since undergone another intervention surgery in April of 2014 to reband the left pulmonary artery and put a balloon in the RPA. Since last summer she has been doing great at home with her triplet sisters and other two sisters. She still has 24 hour nursing care at home, a feeding tube, is on 0.5 liters of oxegen, and gets physical therapy, occupational therapy, speech and special education services through Early Intervention. Christiana will be undergoing another cardiac catherization in mid-May to see when or if at all they can do the next surgery, named the Glenn, because doctors need to see if her pressures are even enough to even consider the next step.